June, 2018 – Ametherm introduced a new NTC thermistor probe assembly for high-accuracy temperature sensing and measurement in Li-ion battery power applications. The device combines a specially designed ring lug for battery mounting with a high dielectric voltage rating of 4000 VAC. Ametherm’s NTC thermistors are manufactured from a specially formulated metal oxide ceramic material that is extremely accurate in sensing temperature. The PANR 103395-342 probe assembly released today utilizes this same material while offering a half-inch stud-insulated ring lug that enables easy and secure mounting to Li-ion battery terminals. The device is ideal for electric vehicle (EV) batteries, off-grid energy storage, and alternative energy applications. 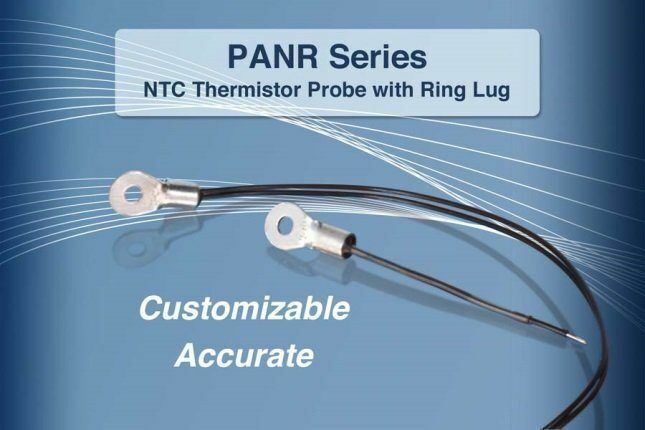 Providing a high-stability replacement for less-accurate thermocouples, the PANR 103395-342 experiences minimal drift from its initial electrical values. The device offers resistance at 25C of 10 kOhm, beta of 3950K, dissipation constant of 8 mW/C, thermal time constant of 10.0 s, and an operating temperature range of – 50C to + 180C. The RoHS-compliant assembly features 18-AWG stranded Teflon-insulated lead wires. The PANR 103395-342 is available direct or through IBS Electronics. Ametherm, headquartered in Carson City, Nevada, was founded in 1994 and specializes in thermistors for temperature sensing and inrush current limiting in industrial, automotive, AMS (avionics, military and space) and many other markets. Ametherm’s devices are some of the highest rated in the industry and are available in customized versions to meet the needs of specific applications. For more information, visit www.ametherm.com or call 800-808-2434. These versatile LED string lights are ideal for applications such as special outdoor occasions, garden or backyard parties, or providing a decorative flair to outdoor restaurant porches, shopping plazas, hotel pool areas, decks, driveways and patios, as well as for sign perimeter lighting. The 48-foot, IP65-rated waterproof black string cord holds 24 1.5-watt S14 LED lamps with a bulb separation of 2 feet. It features industrial-grade outer neoprene rubber sockets that endure years of inclement weather. Industry-leading 18-gauge wiring allows connecting up to 45 strands. Steel cables can be threaded through the built-in loops above each socket to support and position the light strings in variously decorative patterns. Securely packaged in a rugged carton, the 24 twin-filament S14 LED lamps come in a choice of warm, 2200K “filament” white or 2700K “halogen” white. They feature a clear glass lens and an E26 base, operate on 120VAC, and provide a 360° omnidirectional illumination of 150 lumens each—an efficacy of 100 lumens per watt! The IP65-rated, moisture-resistant LED lamps boast a wide operating temperature range of -40°F to +122°F — ideal for outdoor, inclement-weather applications. Consuming only 1.5 watts each (36W total string), they offer energy savings of up to 50% over incandescent lamps, and lumen maintenance of over 70% at more than 15,000 hours. LED lamps produce almost no heat and require 80 to 90% less operating power than equivalent incandescent bulbs, making them as friendly to the environment as they are to the operating budget. Unlike tungsten or halogen lamps, these LED lamps do not use any toxic metals and thus are RoHS compliant. Both the S14 LED lamps and the 48-ft black neoprene string cord are UL-listed and come with a 2-year and 3-year unconditional LEDtronics warranty, respectively. The LEDtronics All-Weather, UL-Listed, Filament-look LED String Lights are available through LEDtronics distributors, and quantity discounts are available. Since 1983, LEDtronics has been America’s Premium Brand LED Company. We are the pioneers of designing, manufacturing and packaging LED lighting products for hundreds of industries and thousands of customers, including 80 percent of Fortune 500 companies and all the major national and regional US distributors. LEDtronics is proud to have been manufacturing in the USA for over three decades now. The company is a qualified Government and Defense supplier (CAGE code 8Z410), and over 600 National Stock Numbers (NSN) have been assigned to our products over the years. All of our products come with an UNCONDITIONAL U.S. factory warranty. PANJIT International is a public company founded in May 1986. PANJIT is the manufacturer of rectifier diodes, power semiconductors, surge suppressors and other discrete components with more than 30 years of experience. PANJIT is committed to developing automotive-grade products for automotive applications and provides first-class quality products for the automotive market. Moreover, PanJit implements the quality program of automotive industry to PanJit’s product line in order to ensure that PanJit’s processes of manufacture and quality control can meet the needs of automotive industry’s reliability and durability. For the quality of automotive-grade products, PANJIT has a series of process plans abided by the principle of Zero Defect; which covers the strict checks of product design, quality certification, manufacturing and testing in order to continuously improve PANJIT’s technology and capacity. Product design follow the APQP process, obey the automotive level design rule, and implement DFMEA / PFMEA potential risk assessment. It can be ensured to meet the demand of automotive high reliability requirements from the process of product manufacturing to packaging testing through steady design. Automotive grade products are certified by the AEC-Q101 standard. Regularly verify the Automotive Product Reliability Test (Stress Test) for annual plan. Submit the complete PPAP according to customer requirements. Conform to TS16949 quality management system operation to build a comprehensive customer-oriented process in order to meet automotive customers’ needs of quality. LEDtronics ‘Paddle Style’ Retrofit LED Lamps Offer a Cost and Energy-efficient Lighting Solution for Existing Fixtures! LEDtronics announced a brand new series of ‘Paddle Style’ Retrofit LED Lamps! These DLC-listed units can be directly retrofitted into existing area lighting fixtures. With a simple screw-in and ballast bypass, these lamps make switching to LED easier and more affordable than ever! LEDtronics understands that sometimes customers want to maintain their existing light fixtures. It could be to preserve a historical look or follow certain architectural guidelines. Our versatile LEDRA series Retrofit LED Lamps allows the customer to keep their current lighting fixture! It can be directly retrofitted into existing large outdoor area light fixtures, such as ‘cobrahead’ street lights, shoebox luminaires, canopies, wall packs, flood lights, garage lights, and more. Unconditional 5-year U.S. factory warranty. E39 Mogul or E26 Edison/Medium rotating base. Type III oval-beam light pattern. Consumption of only 26 to 113 watts. Isocom Components announced an introduction of the IGBT/MOSFET Gate Drivers. IGBT and MOSFET Drivers from Isocom Components’ optocoupler is ideally suited for driving power IGBTs and MOSFETs used in motor control inverter applications and inverters in power supply systems. Isocom supplies all popular commercial optocoupler industry standard types including many no longer supplied by other manufacturers. In addition, they can produce special parametric selections to meet customer’s specific circuit design requirements. Isocom has been a leading manufacturer of high performance infrared optoelectronic devices for over thirty years, specialising in optocouplers and optoswitches. Vitrohm has an excellent reputation of being a high quality manufacturer of resistive products for decades. Specialized in producing different kinds of wirewound resistors (coated, molded, ceramic or aluminum housed) and film resistors (metal glaze, metal oxide) either surface mount or through hole mountable. Besides offering standard versions there is always the possibility in offering extended specifications and custom resistors with higher pulse capability. Santa Ana, California 6/2017 : IBS Electronics, Inc., one of the world’s largest distributors of electronic components announced it has entered into a franchise distribution agreement with Marl International. Under terms of the agreement, IBS Electronics will distribute Marl International’s portfolio of LED components including PCB mounted LEDs, bulb replacement LEDs, LED lighting, and sealed LED panel indicators globally. “We’re coming off a successful 2016 and have positioned ourselves for even greater success this year. Supply chain development remains a key focus for IBS Electronics as we concentrate on new strategic lines that bring value to our customers. Our partnership with Marl is a perfect example of that, and their products are a strong addition to our line card. IBS Electronics is here to support our customers’ long-term needs, and our relationship with Marl confirms our commitment to bringing them the best solutions.” said Mohsen, Operation Manager at IBS Electronics. With more than 40 years’ experience and a commitment to quality, Marl is an industry leader in the design, manufacture and distribution of LED products and systems. Equipped with state-of-the-art design, engineering and manufacturing facilities in the UK. 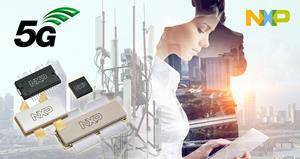 Marl offers a wide range of opto-electronic products and services to customers around the world.